I am always attracted to squash. My mother claims that there were periods during my babyhood in which I would agree to eat little else. There was nothing, it seems, more satisfying than cheeks stained orange with a good thick smearing of the stuff. I no longer require my squash to be pureed and fed to me (although that could still be nice). Having a good friend all but insist I make this recipe is a very close second. A tie, even. One good thing to come out of this blog is that now people other than my mother are interested in feeding me. Or at least, in suggesting what I should feed myself. This recipe comes from a very trusted friend, someone always full of glowing recommendations that also always seem to pan out. Todd was my roommate for a few months here in New York, and although he now lives in Boston, when he visits, he usually ends up showing me around. This is his mother's recipe, adopted somewhere down the line from Cooking Light. But she's made enough changes to call it her own, and it comes with such high marks that her suggestions should be respected. 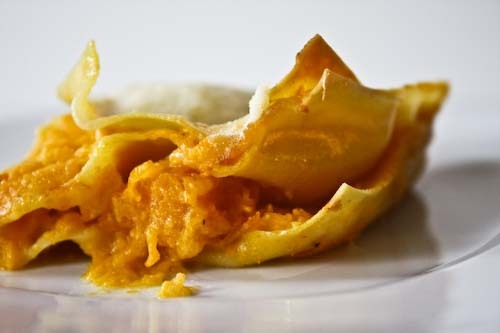 Imagine, layers of caramelized butternut squash enveloped by that creamy, rosemary-infused white sauce and alternating between layers of market-fresh pasta and cheese. Try it now, we can both thank them later. Cut your butternut squash open making two long halves. Scoop out the seeds and place each half cut side down on a sheet tray coated with a little cooking spray. Bake until the skin of the squash can be easily pierced with a fork, about 45 minutes. Let the squash cool down a little before scraping it out with a spoon and setting it aside in a large bowl. Once the squash is cooked, lower the oven temperature to 350. If you have empty tea bags, the kind you can fill with loose tea, fill one with the rosemary. Measure out 3 1/2 cups of milk and a microwave safe glass measuring cup and add the tea bag of rosemary. If you don't have tea bags, simply add the rosemary and strain it out once the milk is heated. Microwave the milk on high for 5 minutes, it would just begin to boil. Allow to stand for 10 minutes before straining the rosemary or removing the tea bag. Spoon the flour into a dry measuring cup (as you should always do when measuring flour) and level with a knife. Combine the flour and the remaining 1/2 cup milk and whisk until you have a well blended slurry. Melt the butter in a large saucepan over medium heat. Add the garlic and cook for 1 minute until the garlic is soft, stirring constantly. Stir in the steeped milk and increase the heat to medium-high. Gradually add the slurry to the pan, stirring constantly with a whisk. Cook the mixture for 15 minutes or until thick, stirring frequently. Remove from heat and stir in 3/4 teaspoon salt and pepper. Combine the milk mixture with the squash, tossing gently. Spread about 1 1/2 cups of the squash mixture onto the bottom of an 11x7" baking dish, which should be coated with cooking spray. Arrange 3 lasagna noodles over the squash mixture. Top with 2 cups squash and 1/4 cup cheese. Repeat layers once more, then end with a layer of noodles. Beat the whipping cream and remaining 3/4 teaspoon salt with a mixer at high speed until soft peaks stage. Spread the cream over the noodles and sprinkle with the 1/4 cup cheese. Cover with foil and bake for 30 minutes. Uncover and bake an additional 15 minutes until golden. Let stand for 10 minutes before digging in and satisfying all of your squash fantasies! You made it! You cannot understand my jealousy. I can't say enough great things about this lasagne. The fact that my father the meatetarian loves it is enough proof of its splendor. This looks really wonderful! I have made a lot of butternut squash things but never lasagna. Wow that looks good! I'll have to try this one! I love the header by the way! Gorgeous! Gorgeous! Gorgeous! I have lasagna noodles that totally need some lovin. This recipe might just do the trick! Thanks for sharing! This looks fantastic and easy! I love butternuts too. Thanks! Thanks for the recipe captainTodd, you da best! Sam, I'm telling everyone to try it! Joy, thank you! I think you'll really enjoy this recipe. Redmenace, butternuts are about the best thing about summer ending. Andrea - this sounds perfect! I've been thinking a lot lately about making a b-nut squash lasagne with the last one that is languishing on the vine behind our house. I'm a super fan of squash and this looks fab! beautiful combo. since i have a weakness for bechamel, i'd prob. add more or make it a bit thicker w/ a bit more butter/flour. this looks sooooo good. 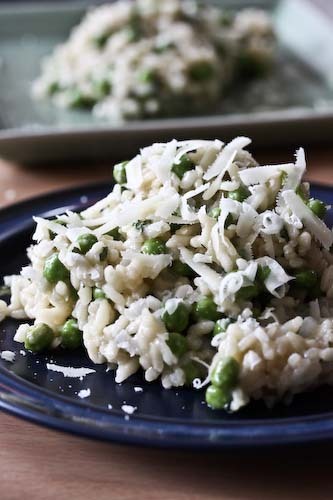 I bookmarked this recipe when you first posted it, but just got around to making it today. It was fantastic! I added some fresh sage to the milk with the rosemary (because I'm not a huge rosemary fan so I wanted to temper it and because I had some sage that needed to be used up). Turned out great! Thanks for the great recipe. 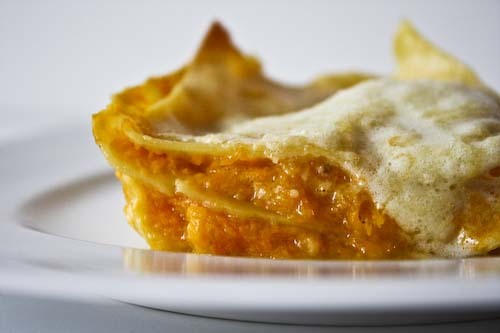 Micha, this lasagna made me realize that gourds in all forms belong between sheets of pasta! We are Never Full, definitely try it with a real bechamel sauce, I think it would be totally over the top. Ememers, I'm so glad you liked it! Sage is a wonderful idea! I just made a lasagna like this, but with sage and used pecans as well. It's soo good! Thanks for this recipe! This lasagna did not last long and I will make it again this week. I'm a huge fan of butternut squash as well. In my opinion, I thought it needed slightly more texture, so I plan to add baby portabellas and walnuts this time around.